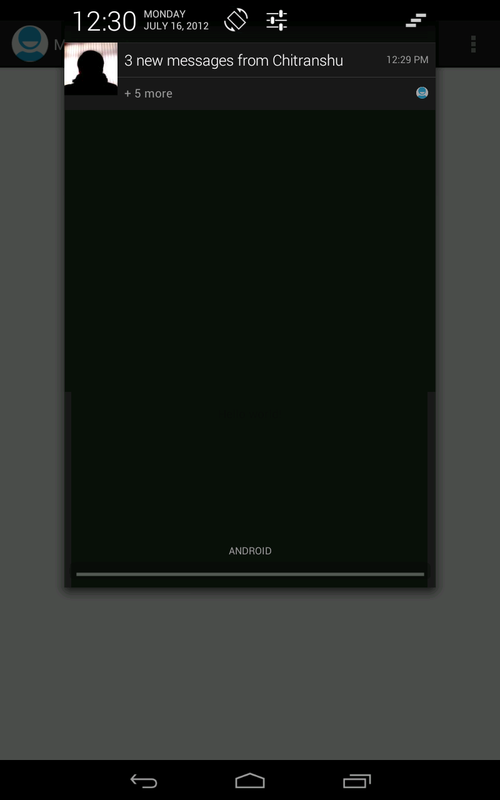 In Android 4.1 Jelly Bean Notification Tutorial we saw how simple notifications can be build on Android 4.1. 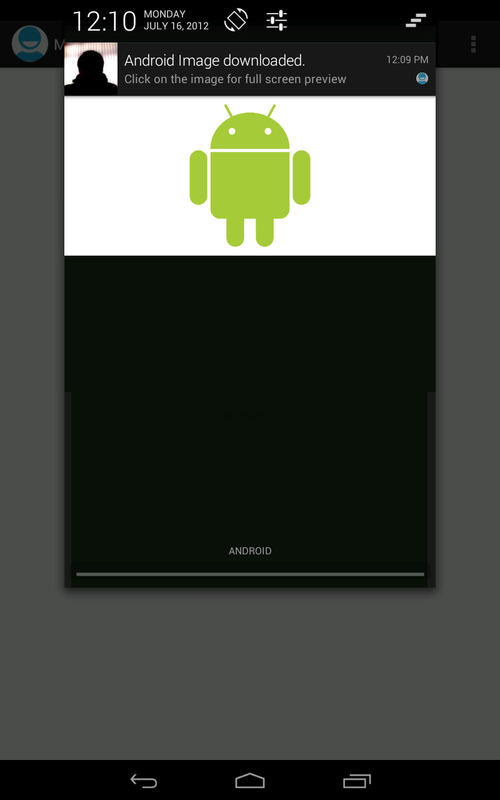 Now let us have a look at 3 new notification styles introduced in Jelly Bean. There are 3 new classes Notification.InboxStyle, Notification.BigPictureStyle & Notification.BigTextStyle which which helps us in creating notifications with larger content area & picture review. Let us have a look at how to use these notification styles and how exactly they look on device. But before we start playing around with these styles, let us create coule of bitmaps for demonstration. // Create the bitmap to be set in notification. 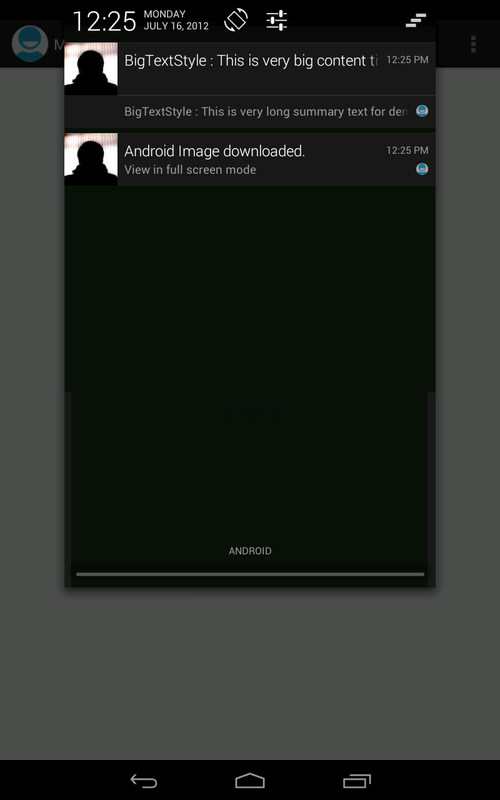 Now since we have the bitmaps ready, lets us have a look at Notification.BigPictureStyle first. You can see that notification has taken bigger content area to display image which looks just awesome. But there is a catch, the big content area is only assigned to the notification till it is the latest notification in the list. The moment you receive any other notification, it will shrink down and rely on the values set in Notification.Builder for display. In next code snippet we will see how to use Notification.BigTextStyle as well as we will also see what happens to Notification.BigPictureStyle when the notification is pushed down from top position. And this is how it looks when we put all together. You are using the big text style and the inbox style wrong. 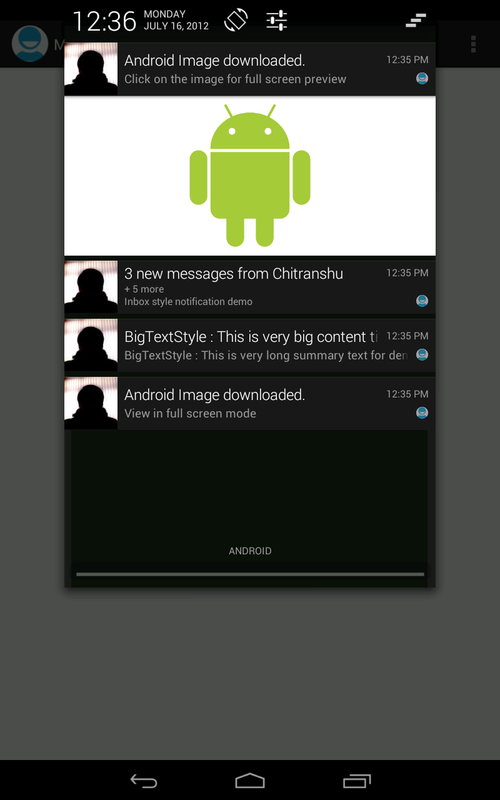 The big text style Builder has a .bigText(String veryLongText) method that adds a very long text to the notification as seen in: http://blog.safaribooksonline.com/2012/08/29/android-4-1-jelly-bean-notifications/ and the InboxStyle has a addLine method that allows to show a list of messages waiting for the user, also seen in the linked post. Hi. First of all, thanks for the tutorial! I have one question: is it possible to show the big image in BigPictureStyle notification even when there are other notifications? Some way to stop it from shrinking.. I don’t know if it’s already explained in the tutorial. If it is, I’m sorry, my English is not so good so I may not have seen it. I’ve been fighting with the notification icon and cannot seem to remove the padding around it. How did you get the “bigPicture” and “largeIcon” to take up the entire square on the left side of the notification and not leave any padding? Thank you!